i'm back to teaching...two weeks of teaching at MICA...great kids....very excited about their progress already..visual thinking through collage and an oil painting class.teaching during the summer is not easy....your brain is turned off in the teaching way and you forget about time...what time is this class over?...and how to critique...and what am i teaching?....apologies kiddies...apologies. we're having a good time. i'll post some great artwork soon. 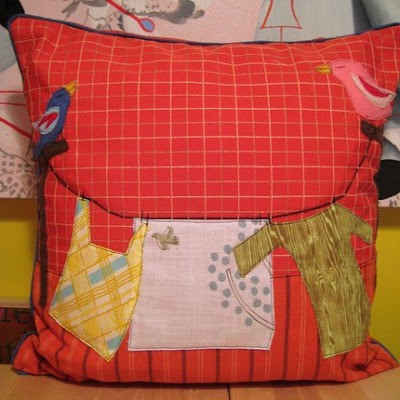 in the meantime..i've made two new pillows and put them in my etsy shop and did not post anything about them on my blog..so here goes...its that summer brain thing again. 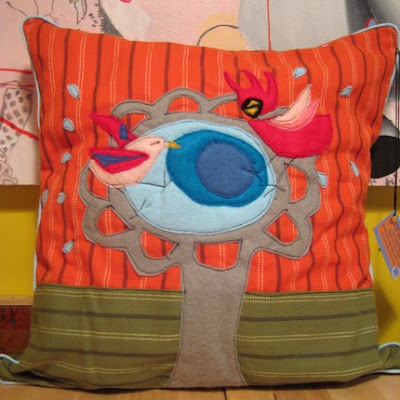 I've made another birdbath pillow in a smaller version, as well as the clothesline version. I'll have to get back into the sweatshop soon...i have a couple of fall events coming up and then its the big get ready for Christmas rush!